It took over a decade to build, but last November, the Lynch Family Skatepark finally opened in Cambridge, MA. The first substantial skatepark in the Boston area, the park has since played host to skaters of all ages, as well as local events through the Charles River Conservancy. This past weekend, the park hosted Innoskate, a two-day celebration featuring speakers, historians, inventors, and scientists from the Smithsonian and MIT. Among the guests in town for Innoskate was Paul Schmitt, known to many as the “Godfather” of modern-day skateboard deck manufacturing. We interviewed Schmitt about why he launched his educational initiative, Create a Skate, why technology isn’t magic, the power of imagination, and how 3D printing could change education and manufacturing. 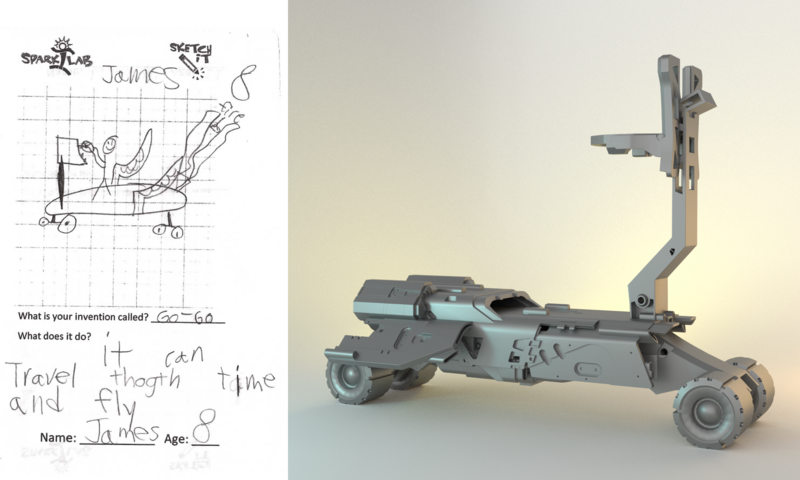 As a kid, making things was a natural part of Schmitt’s daily routine. His dad worked in theater, and he became interested in woodworking early on. He was on the drill press at age 7, the band saw at 8, and the table saw at 9. He spent his last year and a half of vocational high school on the job building sailboats because his teacher felt he couldn’t teach him anything else in the classroom. By the time he was 17, he was selling his own skateboarding products around the world. Recognizing that not every child has access to the same experiences that he did, Schmitt launched the Create a Skate program, where high school juniors and seniors create their own personal skateboard deck using an internet-based curriculum. “My vocational high school experience was amazing. The people who taught me there, the person who passed me on to the boat company, the people before that at the local wood supply store&mdash;they were all people who really empowered me as a young person. So that’s what Create a Skate started with, was me paying forward with what I’d learned and done,” Schmitt said. How does a product end up on a store shelf? And how do the latest technological advancements contribute? “The biggest takeaway that I'm really trying to teach the kids in the program is the fact that something doesn't just appear in a store. For a skateboard, this tree has to be harvested from the forest, it needs to go to the mill to turn it into a log, it has to go to a skateboard factory to get made into a skateboard. It has to go to a retail store to sell to the consumer,” Schmitt said. 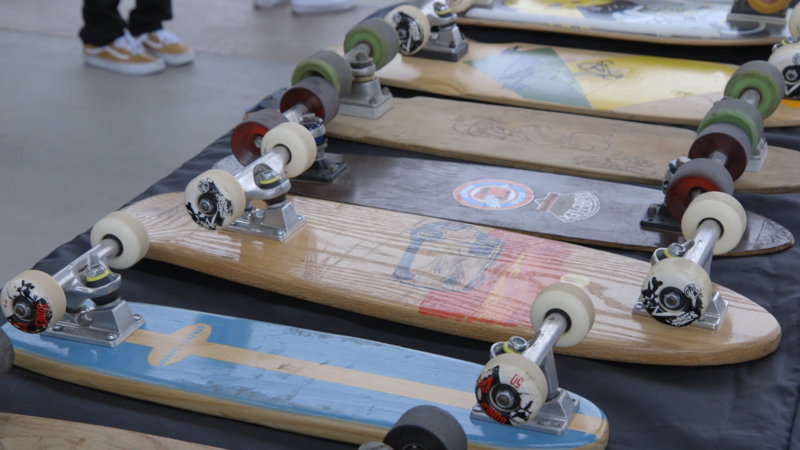 A lineup of skateboards over time, displayed at Innoskate at the Lynch Family Skatepark. Schmitt’s hope is that Create a Skate will not only teach students where products come from, but also provide insight into the satisfaction of making something with their own hands. Often, technology is described as “magic,” but this description fosters a hands-off, inaccessible approach to tech. After all, if technology is magic, who are we to tinker with it? Schmitt believes that 3D printing’s power lies in its ability to put real objects in students’ hands, so long as they’re willing to put in the effort to learn the tools. Skateboard repairs and 3D printed GoPro mounts at the Formlabs Innoskate booth. According to Schmitt, the program is all about setting kids up with “light-bulb moments”&mdash;and it’s okay if that light bulb doesn’t go off for six months, a year, five years, ten years. Formlabs collaborated with the Smithsonian’s Spark!Lab to render the skateboard of the future. “People with experience are hindered by experience, and a child is sort of living in a fantasy land of ideas. I think that sometimes the fantasy of an idea gets lost in society.” Through Create a Skate and his involvement with programs like Innoskate, Schmitt hopes he can help children map imagination to real experiences and tangible creations. Interested in learning more about how 3D printing is changing education, and how you can get started? Watch our webinar recording to learn how 3D printing is currently used in education, how educators at universities and colleges around the country benefit from access to 3D printing technology, how to integrate 3D printing into curricula, and how students can benefit from learning 3D printing. If you're curious about 3D printing and the possibilities of a Formlabs 3D printer, request a free sample part.